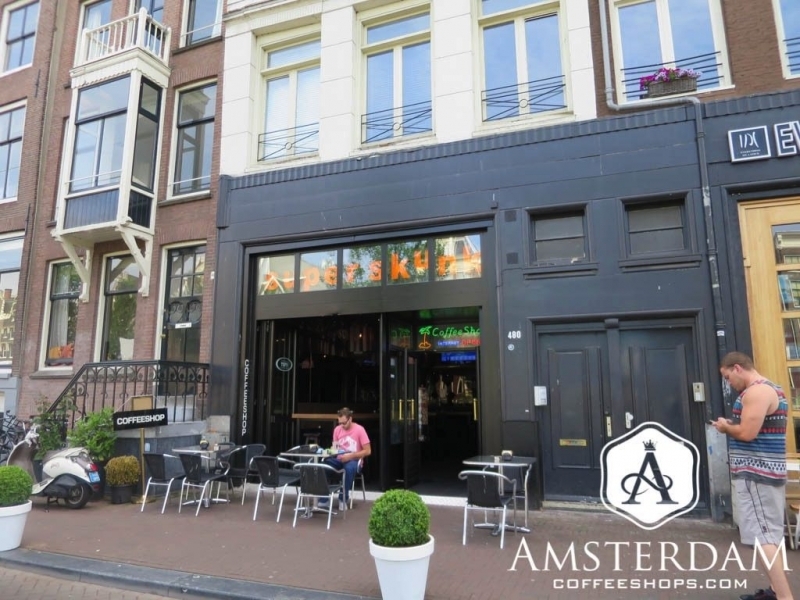 Super Skunk Coffeeshop is located on Prinsengracht (Prince’s Canal), close to the Leidseplein. This square is one of the city’s hotspots, known especially for its active nightlife. While Super Skunk sits just a bit to the north, it is also in a very busy spot, and sits directly on one of the city’s most famous canals. This coffeeshop was once known as Tops. It has since changed its name to Super Skunk, and now has a sister shop of the same name in De Pijp (The Pipe) section of Amsterdam. The building that houses Super Skunk is longer than average for the city center. This provides a bit more room than is typical for the tall narrow architecture of Amsterdam. As such, while not exactly large, this is not a small coffeeshop either. The décor inside is contemporary and impressive, and the shop has a decidedly “upscale lounge” feel to it. Super Skunk is split into two lounge areas. The front has the counter, which is best described as a futuristic glowing cube. There is a lot of polished wood, tables and stools for seating, and some cool accent lighting. If you go on further into the back, you will find a glass-enclosed smoking room. 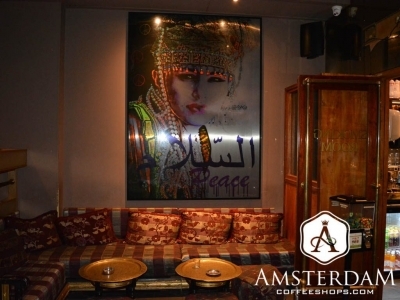 Here, the shop shifts to more of an artsy Arabian theme. There are plush couches and stools, wooden coffeetables, brass fixtures, and funky lighting all around the room. If you prefer an al fresco experience, Super Skunk also has a nice big sidewalk out front. They take advantage of this fully by placing out tables and chairs for patrons to enjoy. 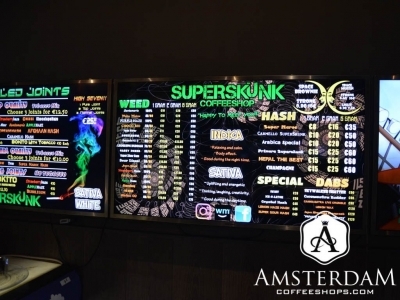 Super Skunk Coffeeshop has a fairly large cannabis menu, with a decent variety of both flower (weed) and hashish (concentrate) options. They also serve gourmet coffees and teas in here, along with a full compliment of drinks and a selection of basic foods, desserts, and snacks... a bit more than you find at most. 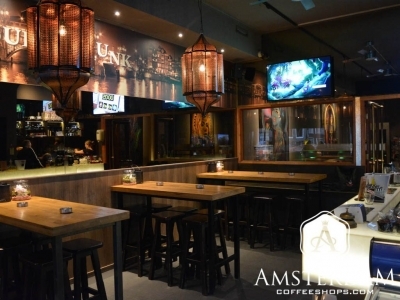 Super Skunk Coffeeshop is a contemporary establishment with a comfortable upscale lounge feel to it. 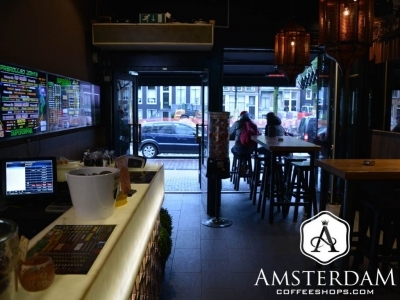 They have a quality cannabis menu, and an ample selection of coffees, teas, basic foods and snacks. The prime outdoor seating on Prinsengracht canal only makes this place better. This shop is recommended if you are in the area. Incredible service, EVERY time I have been there. If you want to chat about the weed you want to buy, this is the place. They stopped serving the queue when I went back up to the counter to ask for a bong... and even the security are friendly here and started talking to us about which bud we wanted while in the queue. The weed was pretty good, the Strawberry and Apple Hazes are nice but I'd suggest trying some of the other strains as they had an odd taste. The atmosphere is great, you can really chill out and literally put your feet up. The crowd it draws in tends to be nice, the only issue is sometimes the music is too loud but maybe this is to cover up the ventilation noise. Music is ideal for smoking too though so not a major issue.